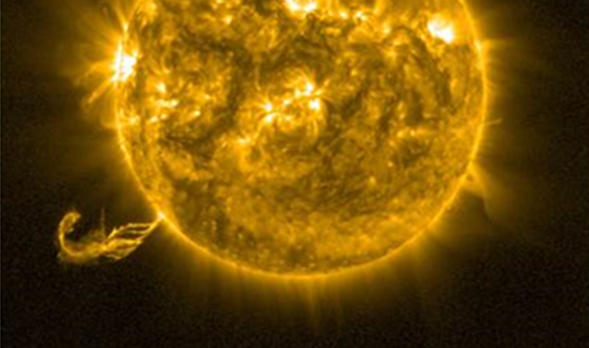 A compilation of the most memorable space weather moments of 2015 can be found underneath. Using the fantastic (J)Helioviewer software, a ***MOVIE*** was created containing one or more clips of each event. 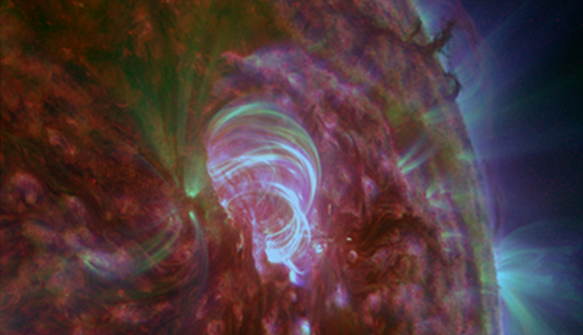 Usually, SDO-images were used, occasionally supplemented with imagery from PROBA2, SOHO, and the GONG H-alpha Network. As this chronological list concerns punctual events on the Sun, it does not contain clips from other noteworthy events in 2015, such as e.g. the DSCOVR launch (11 February), the total solar eclipse (20 March), the transition to the new sunspot number (1 July), the reawakening of STEREO-A (early July), or the 20th anniversary of SOHO (2 December). Even then, it was still quite hard to pick these 15 events from all the other eruptions and activity. We wish you an enjoyable viewing time! 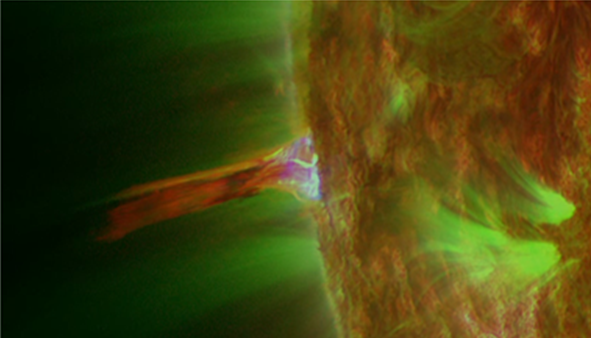 Around noon on 30 January, a spectacular solar jet was visible near the Sun's east limb. 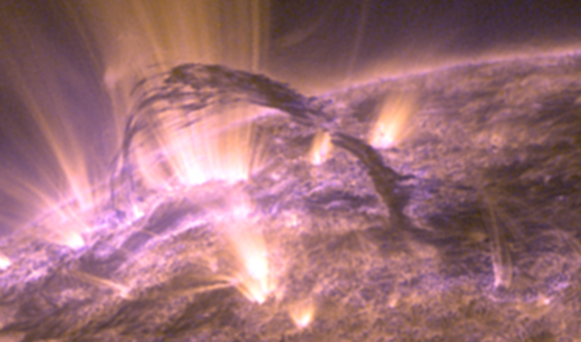 Coronal jets are rather narrow ("squeezed") ejections of solar plasma that result from magnetic reconnection between some emerging flux and pre-existing "open" field structures. 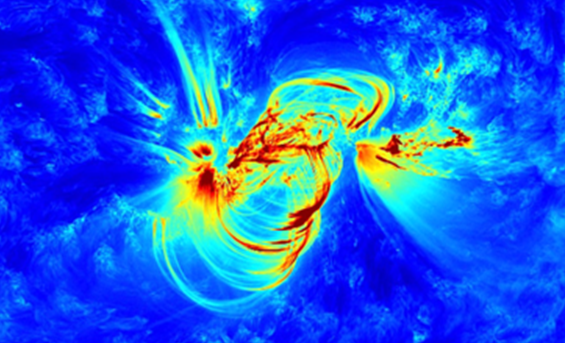 The resulting jets can emit material up into the higher solar atmosphere and even into space if the eruption is strong enough. Jets are not rare, but today's event was certainly one of the more spectacular. 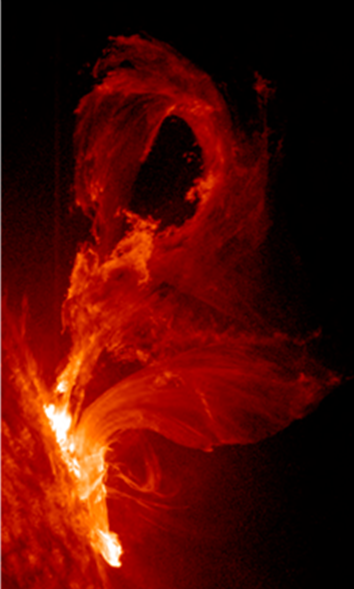 There were plenty of prominence and filament eruptions in 2015! On 24 February, the spectacular eruption of a solid filament near the southeast solar limb was nicely captured by PROBA-2 and SDO solar imagers. The associated coronal mass ejection (CME) had a speed of over 800 km/s, but was not directed to Earth. The modest M3.7 flare on 2 March got accompanied by an impressive and dynamic ejection of plasma. The source region, NOAA 2290, was not very big but magnetically complex. It would go on and produce a total of 4 M-class flares, the last two (and strongest) M-class events being produced when the region had already rounded the northwest solar limb. 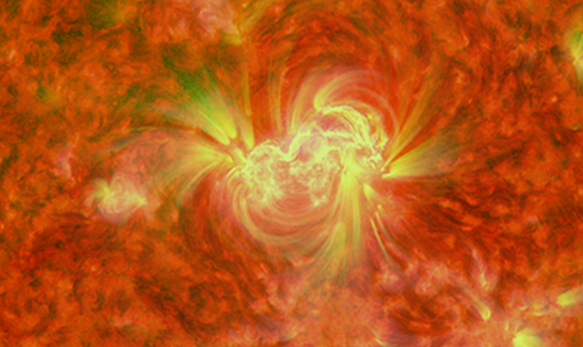 NOAA 2297 supremely ruled the solar activity from 5 till 20 March, and despite its modest size became the most flare active region of the year. It produced more than 20 M-class flares and 1 X-class event, the latter on 11 March. On 15 March, the region produced a rather moderate, but 2-hour long C9 flare which was accompanied by a fast partial halo CME with an earth-directed component. As expected, the CME hit Earth early on Saint Patrick's day, sparking the most intense geomagnetic storm of the current solar cycle (Kp = 8; Dst = -223 nT) so far. The passing CME temporarily reduced the cosmic rays arriving at Earth, and a Forbush decrease of 4.5% was recorded by neutron monitors on Earth (Oulu NM). Prominences are regions of dense and relatively cool material that are squeezed between fields of opposite magnetic polarity, having typical values for height and length of resp. 30.000 km and 100.000 km. The specimen that erupted on 27 March was more than 8 times as tall as the Earth, and had a length of nearly the Earth-Moon distance. For a few days, it was probably the most photographed solar feature before gracefully lifting off in a matter of hours. Interestingly, a filament of similar size erupted about a month later also near the northeast limb. 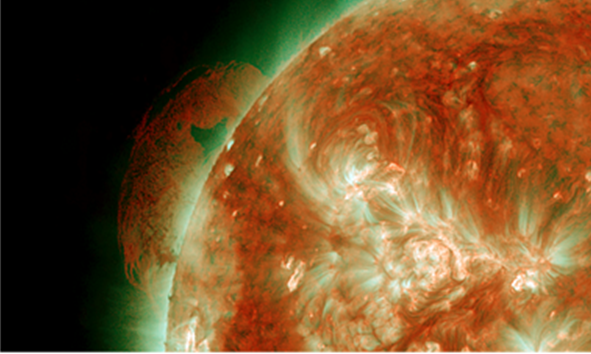 Little did space weather forecasters know at that time, but the strongest, second, and at the same time last X-class solar flare of the year erupted on 05 May 2015. It concerned a modest X2.7 barely lasting 10 minutes. The source region, NOAA 2339, was one of the larger sunspot groups of the year but produced mostly C-class flares. A coronal wave can be seen racing towards the northern polar coronal hole, "kicking" a filament strand near the northeast limb. The associated, fast CME was not directed to Earth. The filament eruption in the southern hemisphere started before the X-class flare and seems to be unrelated. NOAA 2371 was the source of stormy space weather during the last 10 days of June. 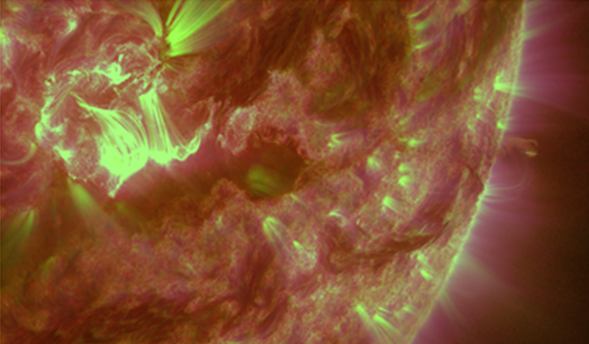 A double M-class flare early on 21 June, and two strong M-class flares on 22 and 25 June resp. were associated with full halo CMEs. This resulted in a severe geomagnetic storm on 22 June (the "Solstice storm"; Kp = 8, Dst = -204 nT) which was the second strongest of the year after the 17 March storm. 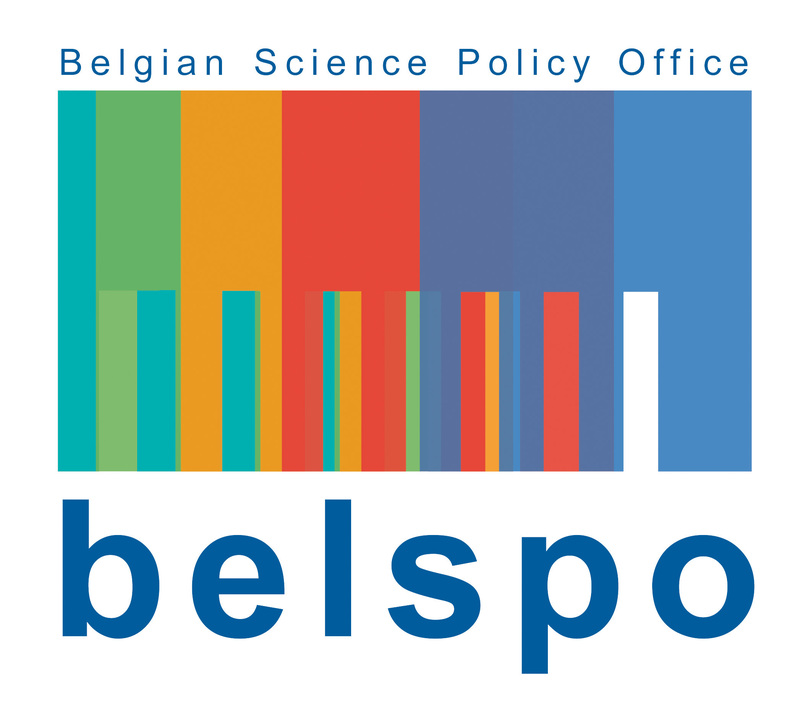 Bz reached -37 nT, the most negative excursion measured in 2015. So far this SC, no extremely severe geomagnetic storm has been observed (Kp = 9). The quick succession of passing CMEs temporarily reduced the cosmic rays arriving at Earth, and a Forbush decrease of nearly 8% was recorded, the strongest of 2015 (Oulu NM). It took nearly a week before neutron counts were back at nominal level. The 21 June flares were most likely also responsible for the strongest proton event of the year, a strong solar radiation event. The peak of this strong solar radiation storm coincided with the peak of the severe geomagnetic storm and the M6 flare, around 19:00UT on 22 June. 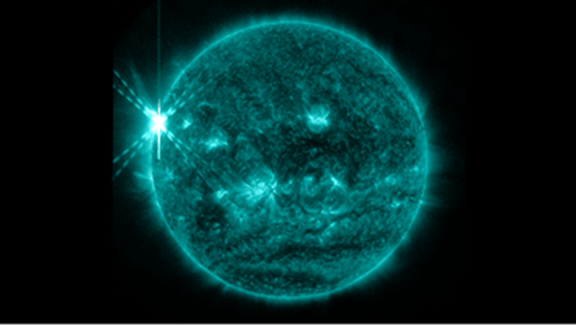 The C-class flare with the longest duration (in 2015) took place on 19 July. Officially, the C2 flare lasted for 3 hours and 40 minutes, but it took several more hours for the x-ray flux to decline back to pre-eruptive levels. 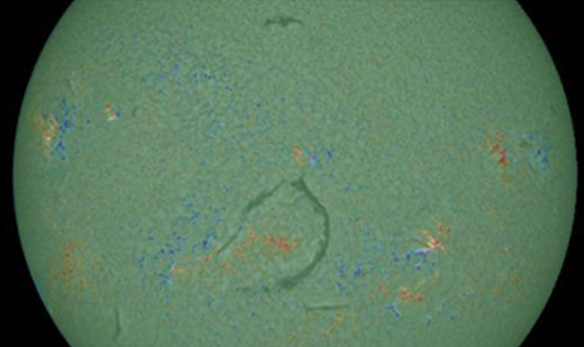 The source of this LDE (Long Duration Event) was a filament eruption near the Sun's west limb. According to NOAA measurements, NOAA 2403 was the largest sunspot region of the year, being slightly larger than NOAA 2371. Both regions had a sunspot area corresponding to about 7 times the total surface area of the Earth. For a reference: Famous sunspot region NOAA 2192 (October 2014) reached nearly 16 times Earth's surface area... NOAA 2403 was magnetically more complex than NOAA 2371, producing almost twice the number of M-class flares (11 vs. 6), but no X-class flares. 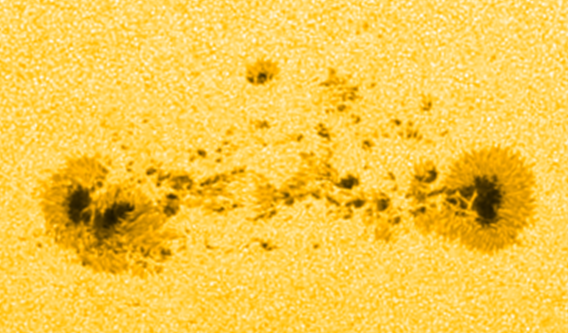 NOAA 2422 was the third largest sunspot region of the year. 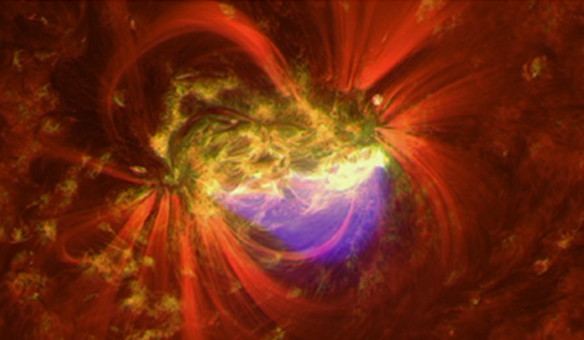 It produced 18 M-class flares, the strongest being an M7.6 eruption on 28 September. It concerned an impulsive event, barely lasting 10 minutes, and was not associated with an obvious CME. In 2015, just 5 groups were responsible for the two X-class flares, about 60% of all M-class flares, and 25% of all C-class events: Compact NOAA 2297, and the 4 largest sunspot regions NOAA 2339, 2371, 2403 and 2422. On 30 September, a prominence near the southwest solar limb got ejected into space. The structure had been visible during the previous 2 weeks, when the surrounding magnetic field finally became unstable and ejected it into space early that day. 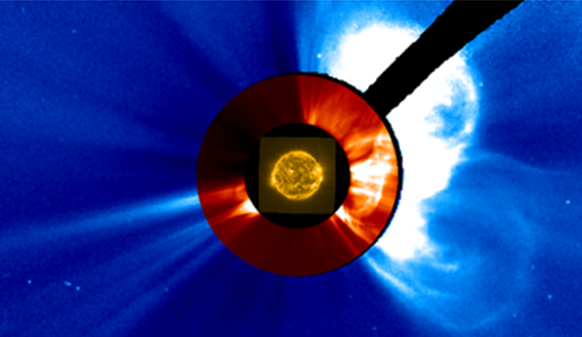 The escaping material triggered more reconnections in the corona, with material raining down near the northwest solar limb. Hence, the first coronal mass ejection (CME) was quickly followed by another CME this time directed to the northwest. At the site of the second eruption, impressive supra-arcade downflows appeared. These are sunward moving voids often seen above developing post-eruption coronal loops. For nearly 3.5 days, solar wind speed at Earth was over 500 km/s. Peak speeds of 810 km/s and more were recorded late on 07 and early on 08 October. 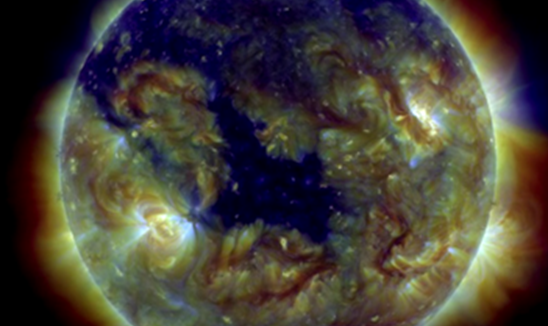 The source of the raging solar wind was a trans-equatorial coronal hole that transited the central meridian early on 05 October. High solar wind speeds (more than 800 km/s) near Earth are rare, happening only twice in 2015 - the other one being on 27 June. Large coronal holes were also observed late January (south pole extension) and early December (north pole extension). On 4 November, NOAA 2443 produced an M3.7 flare peaking at 13:39UT. This at first sight very normal flare was associated with strong radio and ionospheric disturbances that also affected radar and GPS frequencies. As a result, Swedish air traffic was halted for about an hour during the afternoon. The air traffic problems started at the most intense phase of the radio storm, and followed right on the heels of a minor geomagnetic storm caused by the high speed stream of a coronal hole. The CME associated with the M3 flare would cause a moderate (Kp = 6) geomagnetic storm during the first half of 7 November. An 800.000 km, near-circular filament rounded the solar east limb around 7 November. It remained visible until late on 15 November when the surrounding magnetic fields became unstable and the filament erupted. It was followed by a smaller filament eruption to the southwest a few hours later. The bulk of these CMEs was not directed to Earth. Some photogenic flares simply need inclusion in this short-list of memorable space weather events of 2015. Such an event was the M1.8 flare produced by NOAA 2473 during the noon hours of 28 December. This was a long duration event, lasting 169 minutes (nearly 3 hours)! It was associated with a proton enhancement (no event), a lovely arcade (series of post-flare coronal loops), a number of jets near the main spot, and a CME that would lead to a moderate geomagnetic storm as Earth entered a New Year.